A statement that is often used in today’s media is that Liverpool have one of, if not the, best set of supporters in the world. Stand at the front of the Kop on a European night, watching the flags glistening in the floodlights that immerse the famous ground whilst listening to the inhabitants of this great mountain of sporting tribalism belting out the iconic ‘You’ll Never Walk Alone’ and it would be hard not to agree. Yet it’s a great shame that Liverpool’s support is all cast under one sweeping generalisation. As with all football support the idea that Liverpool’s fan base is united by the same beliefs and opinions is incredibly wide of the mark. 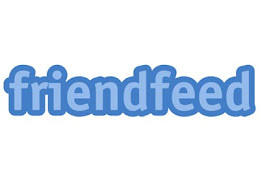 A trip to one of the notable pubs close to Anfield on a match day, or logging on to a Liverpool forum, will provide anyone with enough evidence to suggest that Liverpool supporters are very diversified in their opinions of what is best for Liverpool Football Club. Even when sets of supporters are in agreement on a given topic often an argument can break out on how to reach this situation. Most Liverpool fans will tell you of how they want rid of Tom Hicks and George Gillett, yet there are many different ways of doing this offered by many different supporters, all of which are open for debate. Some supporters are mainly concerned about what's happening on the pitch, others are worried about what's going on at board level, some may even be worried whether the next away kit will be white, black or yellow. All supporters care about the club but all are different. These differences are why it’s incredibly important that Spirit of Shankly – The Liverpool Supporters Union – exists. The Union offers somewhere to bring these debates and have them discussed in a reasonable manner amongst a large number of Liverpool supporters. Union meetings are a democratic environment in which a solution can be voted upon by paying members and, thanks to the strength in numbers the Union has, can then be taken to the highest officials at Liverpool Football Club and discussed with them. 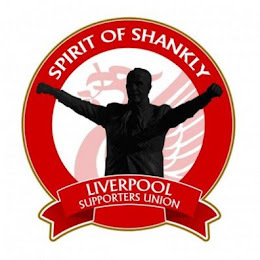 It’s often been said that Spirit of Shankly is a collection of local, match going, supporters and only their opinions are the ones that count to the committee. Of course this is not true, in fact it’s far from it. If you’re a member of the Union you have as much as say in what action is taken as the next member. That, for me, is why it’s essential every Liverpool supporter becomes a member. 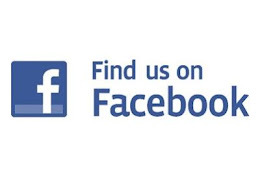 Look on the Union’s Facebook page, check their Twitter followers and you’ll stumble upon a huge number of supporters from all around the globe, all with different views, all from different back grounds and all united in their belief that, as a group, Liverpool supporters can work to improve the quality of the club and community. A lot of the publicity the Union has received, the primary source of their popularity, is from their work with the current ownership situation. No other organisation has taken part in so many talks with high-level officials at the club, no other group has held more rallies and demonstrations to further publicise the cause and no one else has forced the club to listen more than Spirit of Shankly. Yet for me their efforts on forcing Tom Hicks and George Gillett out of Anfield are just a small part of what the Union has to offer. Their work in the community is commendable, most notably their free football training sessions with local children, many of whom may not have the means to pay for the shockingly expensive days that professionals, including our club, offer. Affordable travel to away games is another fantastic and useful service which the Union has worked hard to offer its members. Whilst the club have looked to raise ticket prices whenever possible, and teamed up with profit-hungry companies such as Thomas Cook, the Union has battled to offer amazingly cheap travel options so the average fan can afford to watch their team away from home. That’s not to say the Union is faultless, a very well publicised occurance took place during an end-of-season party run by the Union which had many up in arms, The Union handled this as well as they could, making changes for the next event of similar style. But every organisation that grows this fast has similar problems, so long as they are handled properly, which they were, they can forgiven. During a time of such negativity at Liverpool Football Club, having a united fan base is essential. Everyone has a difference of a opinion, everyone believes their way of doing things is right but the main thing is with the Liverpool Supporters Union everyone has a voice. Tough words - soft on action. I'm not sure how serious anybody takes an organisation that demands the owners out, yet continues to condone it's committe and members pumping £40 towards the owners week in and week out. The great Shankly wouldn't be paying his £40 each week to keep the owners at the club. A large number of fans believed it was time for a boycott a long time ago. SOS need to lead the way on this - not make excuses that just dont wash.
Boycotting games won't work. There's to high a demand for tickets, especially season tickets. If members boycotted the game then someone less informed on the ownership situation would simply come and take their seat. Other boycott's can work, particularly the boycott of merchandise, which many SOS members,including myself, currently do. Is David N'gog good enough? Is Mascherano’s departure a surprise? Joe Cole in the hole... or maybe not? 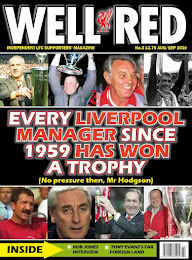 Copyright © 2010 The Anfield Opinion All rights reserved.